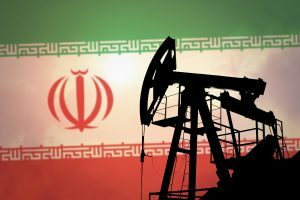 New sanctions against Iran boosted crude oil prices Tuesday, on the expectation of supply disruptions. The resilient strength of second-quarter corporate earnings cheered investors as well. Apprehensions of trade war were vanquished, as animal spirits reigned on Wall Street. The major stock indices closed sharply higher, with energy and technology stocks leading the way. The energy super majors were among the biggest gainers, notably Exxon Mobil (NYSE: XOM) and BP (NYSE: BP), which jumped 1.31% and 1.36%, respectively. Of the 413 S&P 500 companies that have reported earnings so far, 79.2% have exceeded estimates. But the dominant story today was Iran and the prospect of reduced global production, which is a boon for the energy industry and by extension the broader markets. West Texas Intermediate, the U.S. benchmark, rose 0.01% today to close at $69.02 per barrel. Brent North Sea crude, on which international oils are based, jumped 1.02% to close at $74.50/bbl. The benchmark Energy Select Sector SPDR ETF (XLE) rose 0.72% today. The XLE has generated a total return of 6.57% year to date, compared to a YTD return of 2.52% for the SPDR S&P 500 ETF (SPY). Over the vigorous objections of America’s allies, new U.S. sanctions against Iran took effect today. The White House vowed that firms doing business with Tehran would be barred from doing any business with the U.S. The Trump administration this year pulled out of a 2015 deal to remove sanctions against Iran in return for limits on Iran’s nuclear program. Britain, France, Germany, Russia, and China were co-sponsors of the deal; they all opposed Washington’s decision. The U.S. sanctions on Iran that kicked in today are part of Trump’s strategy to apply maximum pressure on Tehran over its nuclear program, as well as the Islamic state’s alleged misconduct in the Middle East by supporting insurgents. The unilateral U.S. sanctions prohibit Iran’s purchase of U.S. dollars and precious metals and impose sanctions on a broad range of Iranian industries. The energy industry is highly sensitive to U.S. sanctions because the petrodollar is the single most important currency in global trade. Washington can exert major pressure on countries by restricting access to the dollar through its financial institutions. The ultra-hawks that govern Trump’s foreign policy hope that the Iranian theocracy will collapse from the pressure, paving the way for “regime change.” That’s a tall order. Trying to force the replacement of an entire government, especially in the volatile Middle East, is a risky policy that could spawn dire and unforeseen consequences. Just ask the Iraqis. Not surprisingly, Iran today vowed defiance. The upshot: Global oil supplies are about to become extremely tight, further pushing up the price of oil. 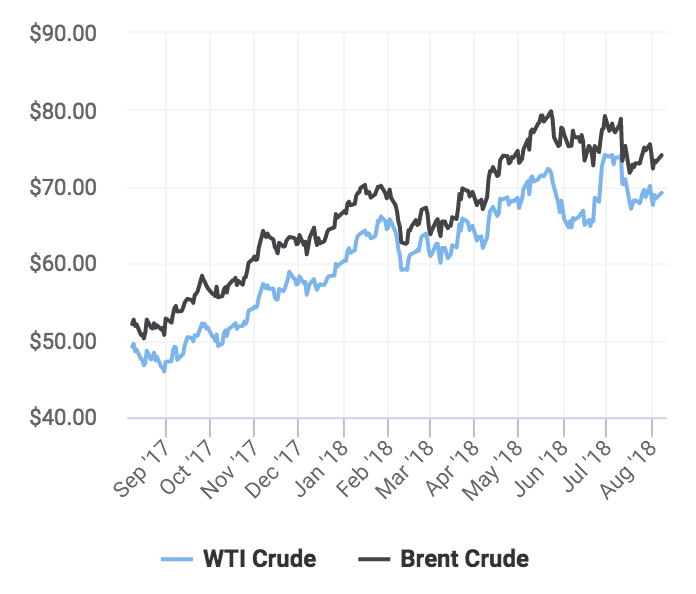 Crude’s momentum should continue for the rest of 2018 and into next year. Today’s imposition of sanctions on Iran is expected to remove up to 1 million barrels per day (BPD) off the market. But Iran isn’t the only wild card among major oil producers. Venezuela remains strife torn and riven by oil supply disruptions. Saturday’s unsuccessful assassination attempt against Venezuelan President Nicolás Maduro only adds to the country’s chaos. In a scene right out of a Mission: Impossible movie, the attack against Maduro was televised live and carried out by unknown rebels using several bomb-laden, remote-controlled drones. Maduro placed partial blame for the attack on (you guessed it) America. Libya also is afflicted by several destabilizing forces, including a worsening migrant crisis. In the U.S., supply growth is sustainable but impeded by infrastructure limitations. The shale production revolution in North America turned the U.S. into the world’s largest producer of oil. America actually dethroned Saudi Arabia as the king of oil producers, a landmark that I thought I’d never see in my lifetime. However, production in the U.S. has become so prolific, it has spawned a shortage of crucial fracking materials such as water and sand. Transportation bottlenecks have arisen as well, with extreme tightness in pipeline takeaway capacity. OPEC production cuts also have succeeded in bringing down excess supply, restoring a measure of equilibrium to energy markets. As we saw today, rising oil prices raise not just energy stocks but also Wall Street’s spirits. Small business lender beats on earnings. Specialty drug developer beats on earnings and revenue. Cloud platform provider posts strong revenue outlook. Biotech’s new drug flunks late-stage study. Biotech gets weaker licensing agreement with drug major. Medical products distributor lags on earnings. “The Internet of Things gets considerable media coverage. Is it really a big investment opportunity or just a lot of hype?” — Mike C.
The Internet of Things (IoT) is an unstoppable trend with enormous growth potential. IoT devices exchange information with each other via a central server, without a human being as intermediary. IoT is giving birth to smart homes and utility meters, driverless cars, self-calibrating medical devices…you name it.